Massage Gift Vouchers can be purchased as a treatment of your choice or a set amount. Gift vouchers ordered by phone or email can be paid by posting a cheque. Upon payment receipt, I will post a beautifully presented gift voucher to you via regular post. 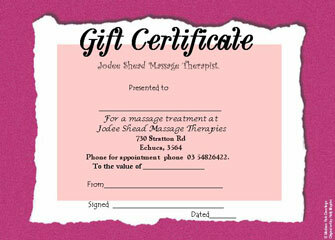 Phone 03 5482 6422 to purchase your gift voucher or contact Jodee.